Visitors to this large state forest could easily spend the whole day birding and wildlife viewing. Twelve miles of multi-use trails and numerous miles of unpaved forest roads (accessible to most vehicles) are available; NOTE: some roads are closed outside of hunting season. 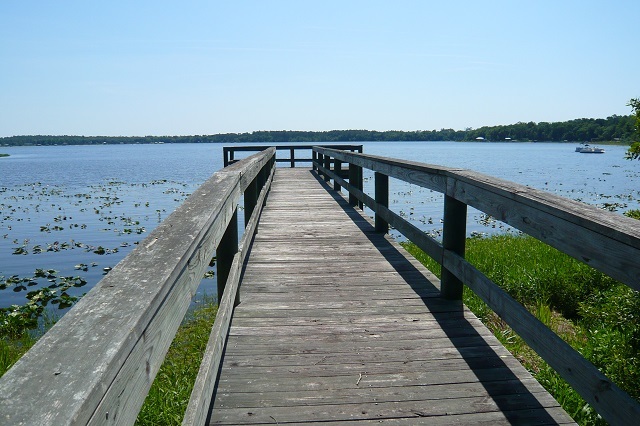 Habitats include a 770-acre lake, sandhills, pine flatwoods, scrub, hardwoods, freshwater swamp and freshwater wetlands, plus miles of tannic streams, and open fields. Look for resident species such as Southeastern American Kestrel, Northern Bobwhite, Brown-headed Nuthatch, Pine Warbler, Downy Woodpecker, and Northern Flickers along the Longleaf Pine Trail. George’s Lake Trail off Tinsley Rd. leads through bottomland hardwoods to a lakeside observation deck. Explore scrub and flatwoods communities at the Holloway Day Use Area (access fee charged) for Red-headed Woodpeckers, Great Crested Flycatchers and Bachman’s Sparrows. While in the forest you may also encounter Sherman’s Fox Squirrel, Gopher Tortoise and several species of swallowtail butterflies. Primitive camping is allowed by permit; listen for resident Great Horned Owls and Chuck-wills-widows (summer). Seasonal hunting takes place at this site; please click here for more information.